The Knob Job a very clever fly modelled on Kelly Gallops Bottom Up. The marriage of a Gold Head and a Booby what more could you want on the end of your rod? Giving a top killing sinking floating fly, where tantalising movement is always assured. Fish on a sinking line in deep pools, explore structure with perdition and control with a fly that has the Ultimate allure for fish. 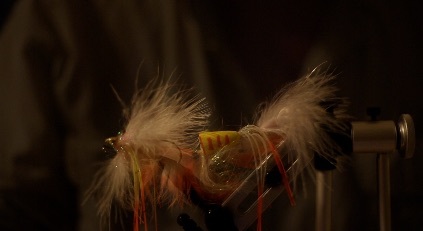 This entry was posted in Blog Posts, Podcast and tagged Articulated Flise, big trout, Fly fishing, Fly Tying, pike fly. Bookmark the permalink.